Many things happening in November! 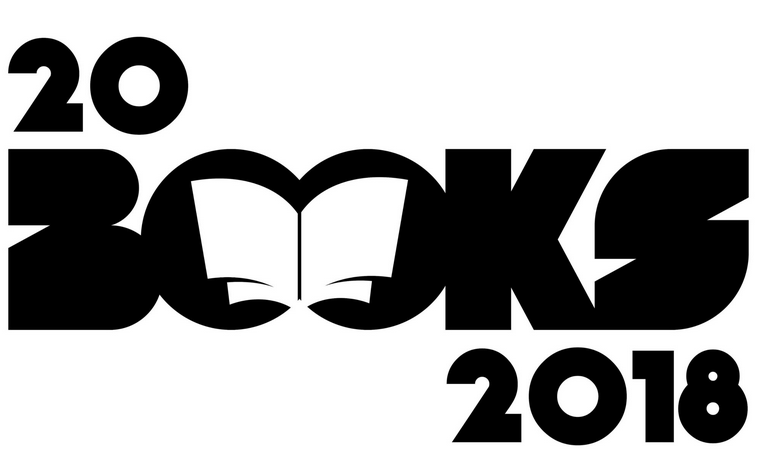 ….if what happens involves books. And, on November 8th I’ll be proud to be part of an author signing with a lot of very big new names in science fiction and fantasy. Including Craig Martelle, Michael Anderle and more. 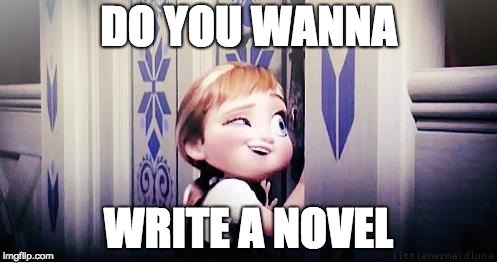 As I send this out, it’s a few days before National Novel Writing Month. One of the funnest month-long marathons I’ve ever been on. Since a lot of people who read also want to write, I heartily recommend this as a fun way to just step in and do it. For those who haven’t heard of it, it’s a challenge to write a novel from start to finish in one month. You can plot beforehand – or not. The rules are simple: write a new block of 50,000 words from Nov 1st to Nov. 30th. It’s a great way to explore ideas you otherwise might never get to – and even better, it’s a fantastic way to get past the unhelpful amount of self-criticism many people can have. It’s a lark. And also, it’s statistically near impossible for all 50,000 of those words to be bad. For me, since I’ve done this almost every year since 2005, I’m upping the challenge on myself – I’m going for writing two novels for at total of at 100,000 words. I’m training up for it by breaking in a new coffee maker. So far, so caffeinated, so good. A lot happened in October, but this caught my eye. 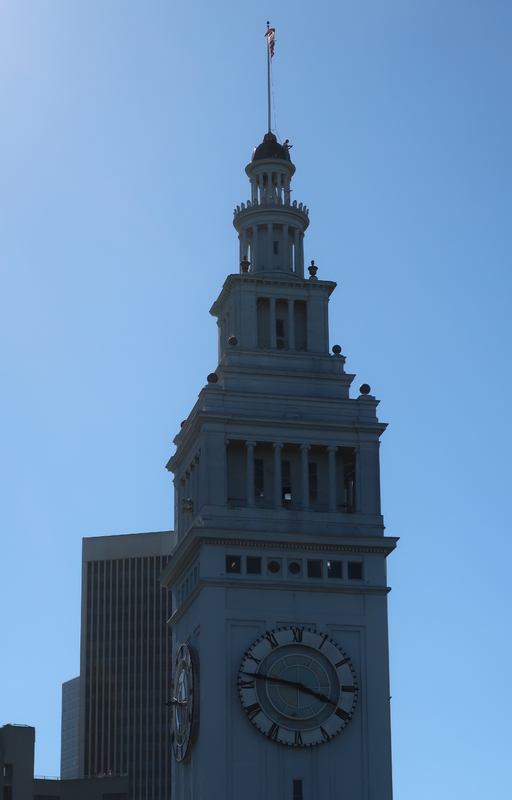 It was Fleet Week, and the Blue Angels acrobatic team were performing acrobatic air stunts over San Francisco. Pretty amazing. I brought my camera. …to take pictures with his cellphone. 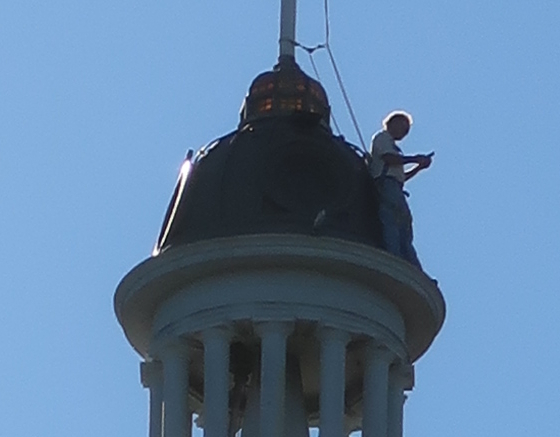 That was in some ways more amazing than the Blue Angels. This upcoming month brings us Thanksgiving, also known as Turkey Day. I’m rather sentimental about it – I consider it an opportunity to celebrate family and friends, and be thankful for what we have. So do enjoy it, and consider that Christmas will be here soon enough. Also for this month, in addition to traditionally sleep-inducing amounts of food, are some book giveaways. First and foremost is a book by the team of J. T. Lawrence and M.J. Krauss. 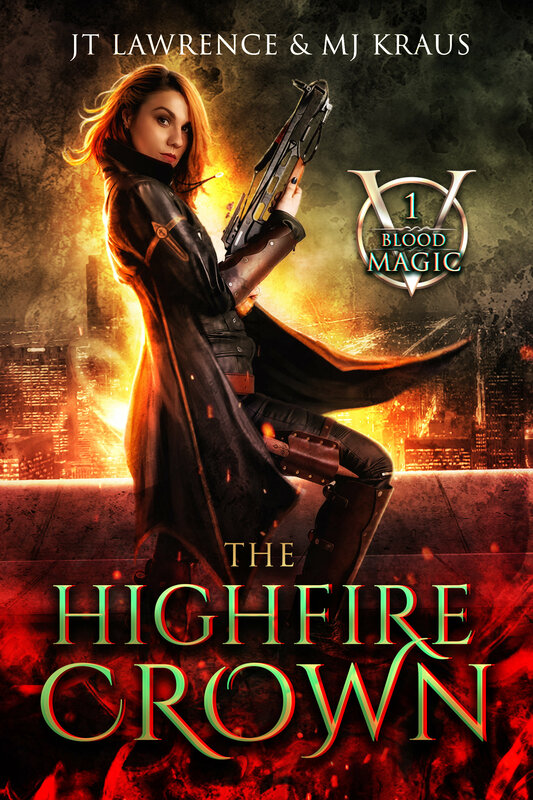 They have a new urban fantasy novel “The Highfire Crown“. The first in the six-book series “Blood Magic”, it puts you right in the action from the first page. Currently FREE in Kindle Unlimited, and 99 cents in Amazon through the month of November. I’m also involved in some giveaways of my own, below. Lots of other fine books are available there besides mine, feel free to check ’em out. 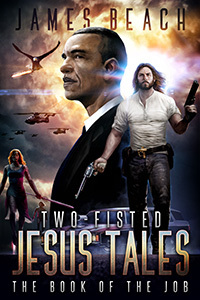 My novel “Two-Fisted Jesus Tales: Book 1” is part of “Bleak Midwinter“. So stay warm and indoors with my tale of Jesus as Chuck Norris. 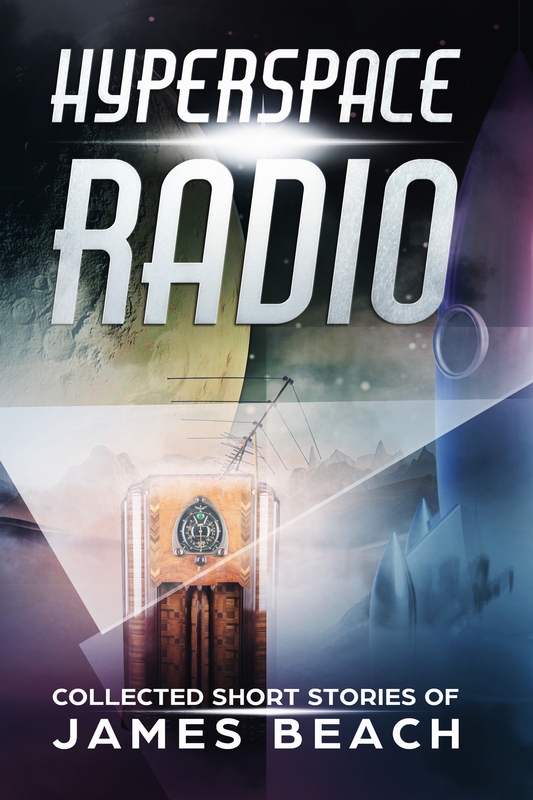 My own little Twilight Zone, the Hyperspace Radio short story collection has been doing quite well. I’m proud to have it in good company with the StarVember giveaway. 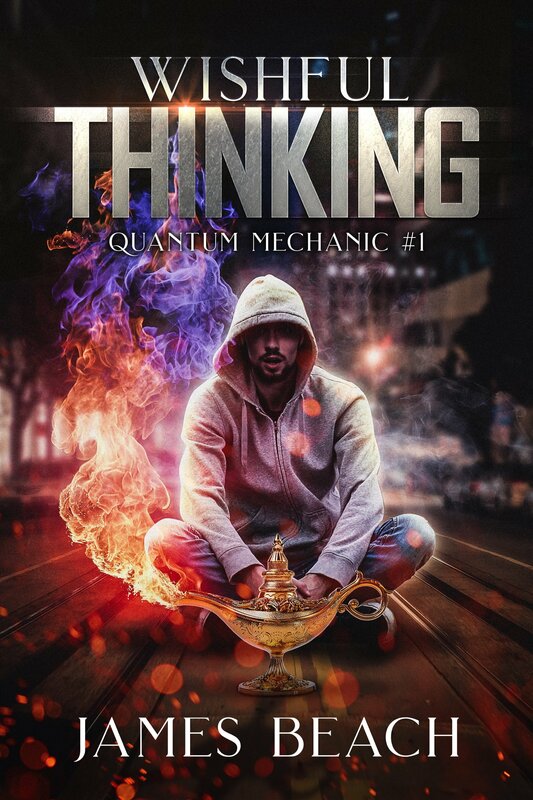 My novella about a young man who becomes a troubleshooter for magical startups, Wishful Thinking, is available in the promo at Prolific Works. I’ve also finished the second in this series, and expect to release it soon. 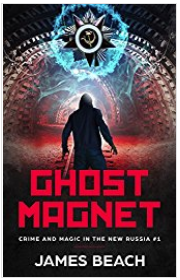 And last but never least, I’m proud to have my tale Ghost Magnet in a fine collection of horror thrillers, The Hunger paranomrmal and horror fiction giveaway. Rounding out a lot of things going on, I’m now on Bookbub. It’s a great way to find out about authors and books, and explore genres that you’re interested in. If you’d like to follow me, click below. News of how November went, a report from Las Vegas, and maybe Halloween pictures too! Also more upcoming novels, short stories, books and more tales.For now, may the Great Pumpkin benevolently watch over you; and may the spookiness of the season brings the sweetness, and not only in the form of candy. P.S. Answers to the above costumes. 1. 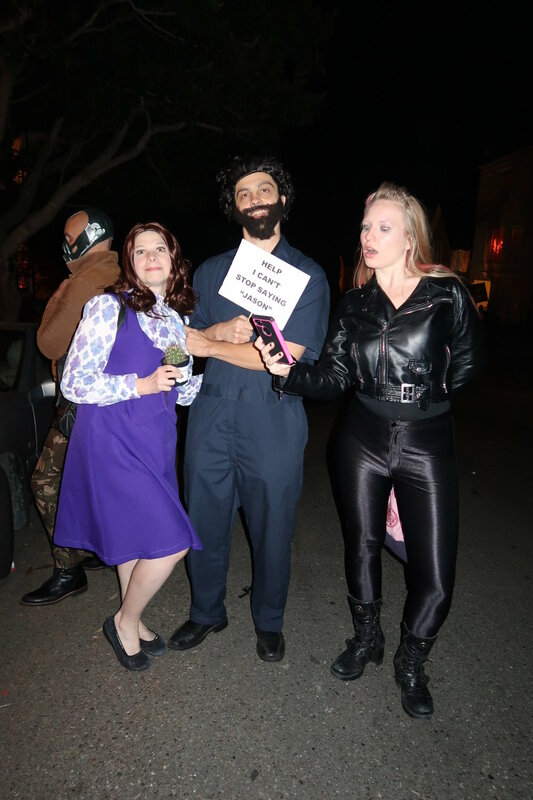 Good Janet, Derek and Bad Janet from the show “The Good Place”. If you haven’t seen it, I recommend it. 2. The eye of Sauron. Yes, that’s right. 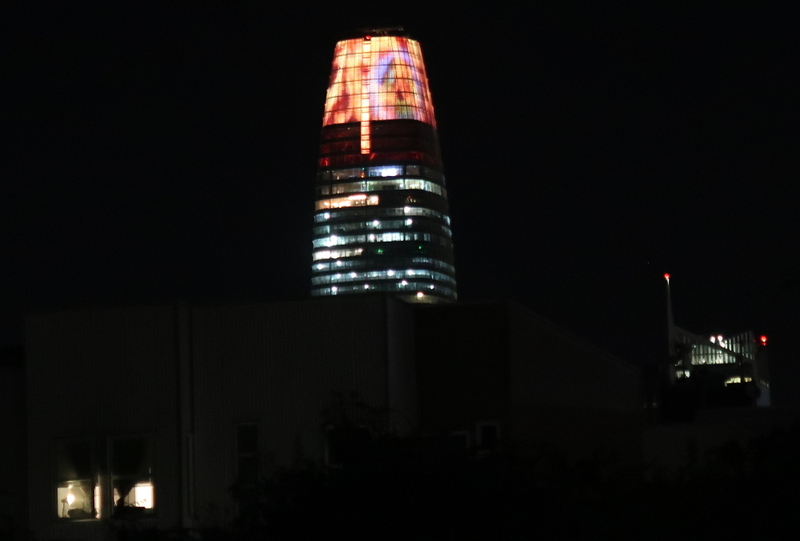 Salesforce frickin’ Tower apparently dressed up for Halloween. A bit on the nose perhaps, but cool.